Well, the most obvious thing that has changed is that there are many more gyms/fitness centers around these days and they are much larger and more equipped than the clubs of yesteryear. I didn’t say better equipped because even though a lot of these centers have more equipment a lot of it is useless to the hard-core bodybuilder and powerlifter. Back in the day most gyms were owned and operated by guys who were passionate about the iron game. It was something that they believed in and wanted to share with others. The clubs back then were filled with tons of weight-plates, some as small as 1.25-lbs and others weighing a massive 100-lbs. The plates were solid steel, unlike todays rubber coated ones and you could always tell when someone was lifting heavy by the clanging sounds the steel plates made as a lifter banged out some intense reps. Back then the exercise machinery was primitive, compared to today’s designs, but very productive. There was a limited variety of machinery to work with but each and every piece was a tool that brought huge gains to the lifters that knew how to use them properly. Now, it’s not all bad, there are some modern exercise machines that are very well designed which can be found in the clubs today. This equipment provides serious lifters with the benefit of performing an exercise through a full range of motion thus working the whole muscle-belly. The result: bigger gains in a shorter period of time with less chance of sustaining an injury. Definitely one thing that didn’t exist in the gyms of the 20th century are the No Judgement Zones that you see in some fitness centers today. When I first started hearing about this I thought it was a joke until I began seeing the commercials. I thought to myself ‘what kind of nonsense is this’ as my jaw dropped to my lower pecs. Sadly I knew that this was yet another nail in the coffin of bodybuilding’s golden era. The clubs have become to civilized. A lot of the fighting spirit has dissipated and what you have today is a shell of what once was. Now I don’t expect anyone who wasn’t around during bodybuilding’s golden era to understand, but the body-men of yesteryear know fully what I’m talking about. Most of today’s trainees wouldn’t last an hour with the barbarian mentality that was prevalent a long, long time ago. What has also disappeared with the softening of today’s gyms is the atmosphere. The clubs back then were almost primeval. They were equipped for results and the members trained as if there were no tomorrow. The crashing of the steel and the screams of agony made it feel as if you were in a house of horrors, but in reality the gains made by the men of iron created such a unique atmosphere that everyone benefited by the energy these men generated. Bodybuilding was serious business during the Iron Age. There were physiques to be built and super heavy weights to lift. Unlike today, there was a harmonic vibe in the bodybuilding gyms of yesteryear. The training atmosphere in these gyms was extremely intense as everyone pushed and pulled the steel uniformly as the conquest of steel and muscle waited to be rewarded to those with the grit to go the distance. In my Staten Island Bodybuilding Club we had a dungeon geared for heavy lifting called the ANIMAL ROOM because of the barbaric training performed there. On the fully equipped floor above it hung a 50 foot banner with the words TRAIN WITH THE INSANE (in the middle of the words was a drawing of a raging Incredible Hulk). If this doesn’t give you a sense of what the training mentality was back then…nothing will. Today, the cellphones and social media have created a lot of chatter in the gyms. Very distracting. And what’s with all the high resolution TV’s? Do we really need to watch soap operas while squatting heavy steel? The best is the high tech sound systems, they sound great if you’re in a nightclub. But seriously, they have no place in a hard-core gym (few exist anymore). And that’s the problem, the FOCUS is gone and because of this so are the potential maximum gains that one could have achieved. Back in the day when you entered the gym you left the world you just came from outside its doors. All that existed was the workout before you. The exercises, the sets, the reps, the humongous poundage that you were going to master. That was the realm you entered and nothing else mattered or existed. You were focused because you wanted to succeed. There was no idle chatter, no TV, no BS. You were there to push yourself to the limit and to accomplish this you needed to enter the zone. Another difference with today’s gyms is the absence of posters displaying bodybuilding’s champions. These posters, which were sometimes life-size, use to inspire bodybuilders to train harder so perhaps they might one day create a similar physique. But I can’t blame the absence of these posters on the individual clubs because it’s the steroid laden image that the sport of bodybuilding has brought upon itself the makes these places shy away from hanging such images. It wasn’t uncommon to see a dozen or so physique posters hanging throughout the gyms, today its images of athletes, some running, some playing basketball or whatever, all this has led to the softening of the gyms. But it’s not all bad. The heating and air-conditioning systems in today’s clubs are very accommodating in keeping a trainee from either overheating or getting frostbite on his hands while curling with a cold bar. I remember training in dungeons, where the air was so thick that we had to crawl up the stairs between sets of heavy squats to get some breathable oxygen. And the rubberized floors are also great. Back in the day the lifting area was primarily concrete with rubber mats placed in strategic locations. I can remember huge craters (caused by the crashing steeling) in those gyms, we all had to be careful not to fall into one while moving around. Today the whole training area is uniformly rubberized making for a much safer environment to train. The gyms are also much cleaner and better maintained thanks to the corporate money running these institutions. The term Personal Trainer didn’t exist back in 70s. 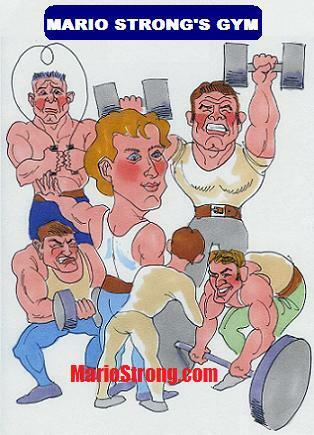 If a trainee had a question on how to do an exercise properly they asked someone in the gym or learned from one of the muscle mags or training booklets that were available by snail mail. There were no training videos or online sites to learn from. For the most part, many of us were on our own taking it one step at a time as we tried to educate ourselves about this thing called bodybuilding. At my club I trained almost everyone. If they needed an exercise or nutritional program I designed one for them. I must have trained thousands during my gym’s existence and this was all provided for at no additional fee. It was expected of me as was the case in most other gyms throughout America. When you signed up at a club it was usually the owner who became your trainer and nutritionist. That’s all changed today. With the advent of study workshops and online schooling many wannabe personal trainers are getting certified from one of the many online organizations. Today, some personal trainers make a very good incomes while others not so good. Like most businesses it’s a case of reputation and supply and demand. There’s a lot more that has changed in the gyms over the decades but the bottom line is that everything eventually changes in life and to survive and flourish we must adopt to the changes as they cross our life’s path. The gyms are no different. The days of the muscle wars has passed. To continue making gains in the gym we must maintain a steady focus on our goals by keeping the fire raging deep within ourselves as we train like there is no tomorrow by pushing and pulling the steel with every ounce of strength we have.